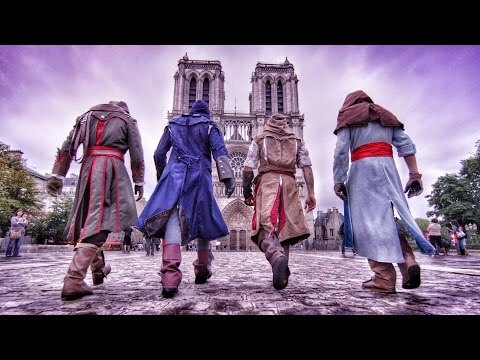 [Short Parkour] Assassin's Creed Unity Meets Parkour in Real Life - 4K! Toujours impressionné par ces athlètes... inspirés des jeux. Question: est ce que la "paternité" du Parkour c'est "Prince of Persia" ? In the game you play as a master Assassin in the French Revolution, and for the first time you can play with your friends in 4-player co-op missions! Parkour/Free-running stunts performed by Ronnie Shalvis and the French FreeRun Family. Make sure to check out their youtube and Facebook pages! And the two guards, check out their Facebook links as well. Film by Devin Graham using the RED Dragon at 6k and 1dc at 4k. Stabilizer used was the Glidecam.